A Joyful Girl...: The Food Was Super, The Company Was Super, But the Bowl? Notsomuch! The Food Was Super, The Company Was Super, But the Bowl? Notsomuch! 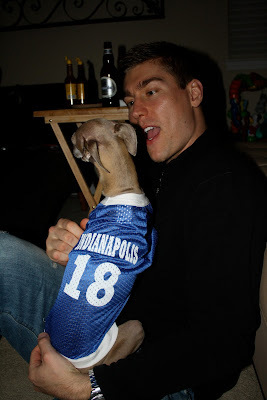 This blog would have been a heckuvalot cooler had the Colts brought home the big Dub-Ya Sunday night, but they didn't. At least they didn't lose to the Patriots. We had a great time on Sunday with a few friends making their way down to our house. And, seriously, we had enough food to feed the neighborhood. I really have nothing spectacular to say about the party -- nothing overly hilarious happened, there was no drama to detail, but the food was dee-lish and Olivia looked stinkin' cute, so that's pretty much why I'm blogging about the Superbowl. And, I'm not ashamed to admit it. 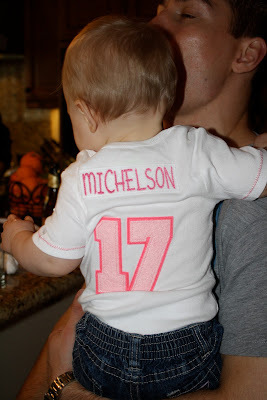 She will keep this onesie for FOREVER! She gets so serious sometimes. David shook out all of the good luck. Really, she is just too cute. I couldn't leave out my baby boy! So, I used my dad's recipe on the wings. And, they were so good. But, they did not even compare to how good they are when my dad makes them. And my mom's cheeseball? Well, it was a WEEEE bit salty. But, we can blame that on the recipe that SHE wrote saying to use 1 TBS of Lawrey's salt. When I asked her on the phone (after making it) how much salt she uses, she said, "Oh, I don't measure it. I just shake a little out." Thanks for the bloating. Best $4.99 I ever spent! 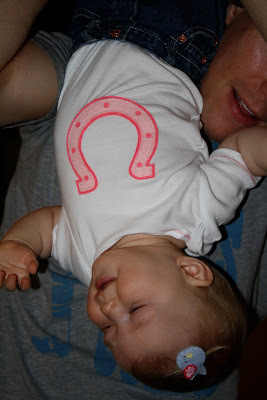 Love, love, love Olivia's Colts onesie! Soooo adorable! And David's hat is pretty spectacular too. :) Glad you guys enjoyed it. Olivia just melts my heart, she's so cute! Yep! Olivia steals the show here again, but Davids hat takes a close second. Those wings look pretty good, I bet David has been enjoying them all week for lunch right? Next time we make the wings together. 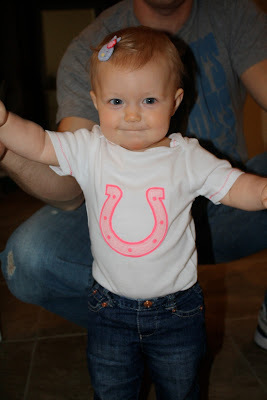 Those darn Colts! Sorry about the cheeseball being too salty. It sure did look like a football tho. 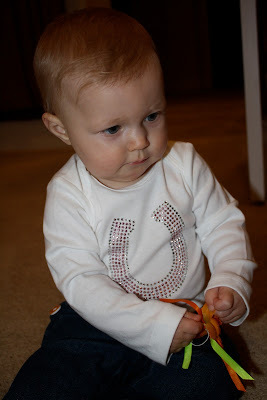 I loved Olivia's Colts outfits. She could wear a phone book and look cute (did I just hear Randy from A I say that)????? 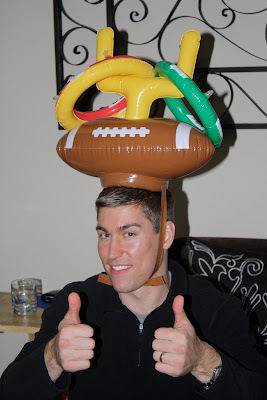 OK Dave I will have to admit you look pretty darn cute yourself in that football ring toss hat! I'm pretty sure no one else could pull the look off as good as you!!!!!!!!!!! Soooooooo cute! She gets more grown up looking every time I see her picture! And can I please have your dads wing recipe? I had hooters and I am still recovering from that gut bomb. Olivia looks adorable! Her blue eyes really shine againg the blue jersey. Great photo of Dave being silly...the best. I'm posting a few weeks late, but looking back on these pictures makes me think: Gosh, what a fun day!